Bill and Kathy Hogue are the owners of Mission Valley Ranch. 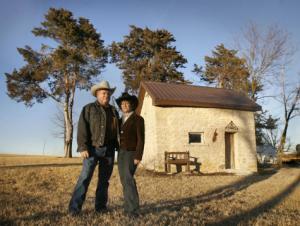 The couple has rebuilt several of the old stone structures on their property in Wabaunsee County. The building behind them was the home of John and Emily Schwalm while they were building their two-story wood home in the 1890s. ALMA - Wabaunsee County is building its future on its past. And a lot of that building is being done one stone at a time. "Everybody's getting into the stone," said Alan Winkler, curator of the Wabaunsee County Historical Museum. Though not all have gotten into it quite like Bill and Kathy Hogue, who have spent the past five years restoring a 140-year-old stone homestead and two smaller stone buildings. 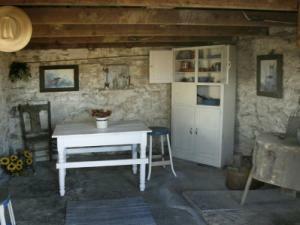 They also have set up workshops on stone fence building and restored a 110-year-old wood-frame house. "I think her work has stirred more interest," Winkler said of Kathy Hogue, who wouldn't let those historic buildings go. The largest stone building on Mission Valley Ranch's 1,265 acres in Wabaunsee County is Stonebridge, which was built in the early 1860s. The Hogues were able to restore the first floor of what was originally a two-story structure and have mostly finished work in the arched cellar below. 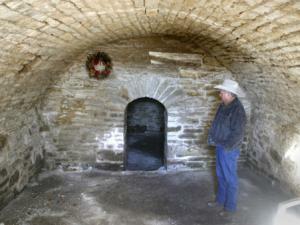 The 1860s' method for building such a cellar was to trench the ground and lay stone on the dirt to form the cellar walls, Bill Hogue said. When the exterior was in place, the dirt inside it was removed. Before they started renovations, tree roots were coming through the stone, and water leakage had weakened the structure. "If we hadn't gotten on this, I question whether it would be here now," Bill Hogue said. A small stone building separate from the main house was used as a summer kitchen and a smokehouse. The Hogues have restored it, too. 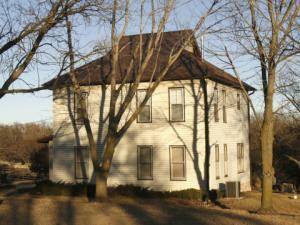 About 1 1/2 miles from Stonebridge is Mission Manor, which was built from wood. Emily and John Schwalm started their homestead in the 1890s, though, with a 9- by 13-foot home of native stone. The stone building has been restored, and the Manor has been updated and serves as the Hogues' favorite retreat. "About all you ever hear is an airplane going over now and then," Bill Hogue said. In the restoration of the Manor, walls were stripped of a red, velvety paper. They had to fill in holes used for the pipes that carried heat from a wood stove on the first floor. And the joists under a bathroom installed on the second floor in the 1950s had been weakened when holes were cut in them to run the plumbing. New joists ensure the structure remains sound. "We tried to keep as much of what was here as we could," Bill Hogue said. He knows a bit about remodeling. While in Wabaunsee County he is a rancher and breeder of top-of-the-line Angus cattle, in Topeka he is a builder. The Hogues are at the construction company office in Topeka every weekday morning, but they can usually find a reason to head back to the ranch in the afternoons. In the late 1980s, Bill Hogue said, he was building 125 houses a year. He started out building custom homes, then got into the spec business - building the house, then finding a buyer. "I could build five specs in the time I built one custom," he said. "Now, I'll build just about anything. "I haven't sold a house since July." He isn't fretting about it, though. "We've been through this stuff before," Bill Hogue said. He has had the ranch since 1958, starting with 325 acres West of Topeka. He has about a 250-cow herd, which means about 500 head are on the property. The land in Wabaunsee County, which was still in the hands of the first owners' descendants, became available in 2004. When he met with the owners to discuss the purchase, they made a handshake contract, Bill Hogue said. "That's how we do it out here," he said. Out here they also make sure to include the neighbors. Hogue buys feed corn from one neighbor, and he has Puffy's Steak and Ice House in Maple Hill cater his annual production sale at the ranch, which this year is March 28. Jim Puff, who owns the restaurant and catering business, has some new neighbors in Alma, where he bought the grocery store. Puff, too, got into some restoration there — the building housing Alma Food Mart (formerly LeGrand's Grocery) is more than 100 years old. It had been an opera house and later a car dealership before it became a grocery store. In the year that he's had it, Puff has completely refurbished the property and added Puffy's Cornerstone Cafe. "The community's been real supportive," Puff said. "When I came out to Maple Hill," he said, "they told me I'd never make it." Last year, the county took in $17,000 in sales tax just from his business, he said. "In these small communities, every dollar that is spent is turned back six times," Puff said. "A lot of people don't understand that. Those dollars have got to be spent at home more." He opted to go to Alma when he couldn't get the property adjacent to the steakhouse for an expansion. "There's a lot of really good people there," he said, but there's a few people who don't want to see the town grow. Winkler agreed that some of the county's residents are reluctant to see more traffic. "I used to think that we ought to gate I-70 and keep people out," Winkler said. "We realize now what a treasure we have." Lake Wabaunsee is one of the treasures that has been drawing more people to the area, but only about a third of the properties around the lake belong to full-time residents, said Cindy Manz, of Lake Wabaunsee Realty. "Some of the biggest houses out here are weekenders," Manz said. She noted recent efforts to boost agritourism in the area. Those include the Native Stone Scenic Byway, which runs from Alma to Dover in Shawnee County, home of the Sommerset Cafe, which "Good Morning America" says has the best slice of pie in the country. And in Alma, the City of Native Stone, the effort to get three blocks of the downtown area designated a historic district has succeeded. The State Historic Preservation Office last week voted to approve the application to have downtown listed on the National Register of Historic Places.